Continuing this post series regarding an ANSI/ISA-95 oriented MES modeling, specific for inventory management (stockpiling), this part emphasizes how production is measured and then transported to product stock yards. It continues using iron ore production as reference. How production is defined in a continuous process? In continuous processes, production is defined in such a different way if compared to batch and discrete processes, where main product characteristics are easier to determine. For an iron ore lot, these questions are very much more complex, but not impossible to answer. Conjunction of several information sources and a close to real process modeling can yield to a very useful representation for inventory and storage control and simulation of a final product dispatch planning and scheduling for customers. Set of context dimensions for lot definition. Unlike batch processes, where product is easily determined for production plant setup and bill of consumption materials, in some continuous processes with several production output products, this final product definition is more complex. Obliviously, for iron ore production, product definition is also given by production plant setup and bill of raw materials. It happens that making these factors stable and as planned is a very difficult task. Process inherent characteristics with high stock in progress brings a lag into setup changes propagation along the whole process. Another matter is that actual chemical composition of ore in extraction fronts is frequently different from planning besides other unpredicted variations, such as moisture (raining) and intermediate stockpile composition, as an example. Product material is pre-determined for a specific control point (production measurement spot – Stacker A, for example) as an expectation. Nevertheless, “quality” (iron ore characteristics) is only given after lab results have been acquired and then, real product definition is stated. 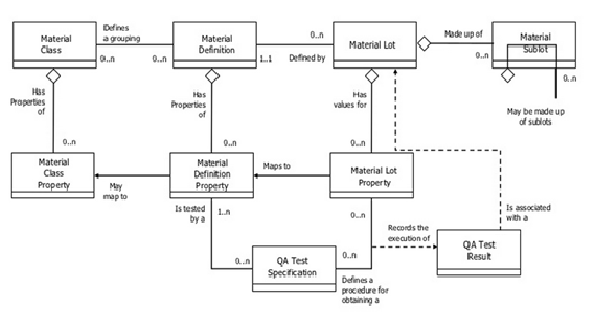 Product stockpile representation at a product yard by its discretization in material lots. 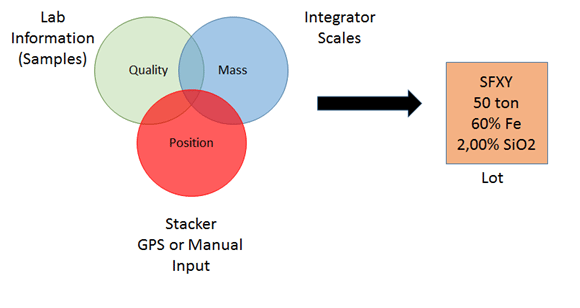 Amount value is regularly given through mass integration scales installed on conveyor belts at stackers, for example. Along well known and defined time spans, these amount values are then summed, generally using PIMS tools and the accounted into MES solutions. Quality definition is attainted through lab results. Lab tests are made using samples got and linked to same production time spans and measurement spots used to calculate production amount values. Position is determined by inherent physical building constraints of production control points, such as stackers, which are designed for small product production sets and in some circumstances, only one. These stackers generally have a restrained and pre-determined reach for storing production. For a specific position, it is necessary to define an exact stacker position via high precision GPS or manual input, given by operator using MES solutions. After defining those three dimensions (position, quality / characteristics and mass), prodution result is determined and production lot defined. 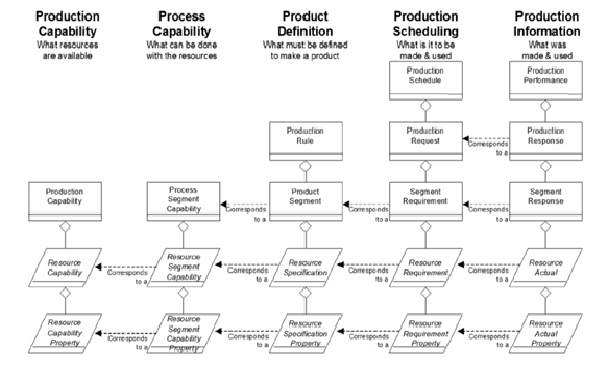 In a summary representation, it is possible to model those discussed process operations and production / inventory phases with “Production Information” ISA-95 concepts and definitions. ISA-95 Modeling – Macro model for different production “timing” since its definition, planning / scheduling to production execution accounting (Production Information). Product mass accounting and summing interval result in production registration itself, “Production Response“ and ”Resource Actual”. Product (“Material Definition”) is defined as the one pre-determined (expected) for that stacker which is further reclassified if necessary. After getting quality and position information, lot context and production result (“Segment Response”) are completely defined. 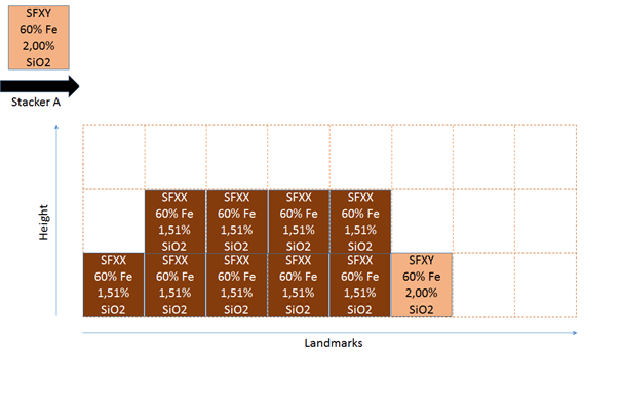 Lot quality characteristics are represented as a set of “Material Lot Property”, such as %Fe and %SiO2. Next part of this series will address product yard internal operations for handling stockpile lots. Watch for the next post.